No discussion of black music in Nashville would be complete without talking about Ernie Young. 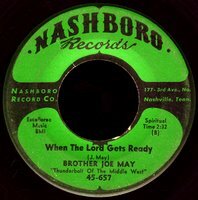 Young, the owner of Ernie's Record Mart, founded his Nashboro Gospel label in 1951 (for more on the Nashboro story, please visit my new Gospel music page, holy ghost). Excello was started as a subsidiary label the following year. Initially viewed as another outlet for his Gospel acts, Young soon realized the potential of the local R&B scene, and began recording regional artists like Kid King and 'Little Maxie' Bailey. 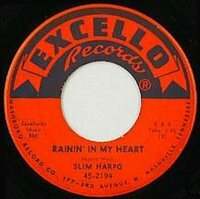 The records didn't make much noise outside of the city limits until they hit big with Excello 2047 in January of 1955. Arthur Gunter's excellent Baby, Let's Play House (now featured over at Brown Eyed Handsome Man) was leased by Chess for national distribution, and would climb to #12 on Billboard's R&B chart, putting Excello on the map (the song would be covered by some guy from Memphis later that year...). The label would have an even bigger hit that summer when Louis Brooks And His Hi-Toppers would ride It's Love Baby (24 Hours A Day) all the way to #2, spending almost three months on the charts. J.D. Miller operated a small studio and record label (Feature) out in the rice country of Crowley, Louisiana. He had been recording some regional Cajun and Country music in the early fifties with moderate success, when he first heard Lightnin' Slim at WXOK in Baton Rouge. 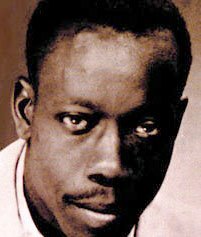 Miller has said that Lightnin's music "did something to me", and, with the help of disc jockey Diggy-Doo, he recorded Lightnin's Bad Luck in the Spring of 1954. He pressed a few copies on Feature and sent them out to both Ernie's Record Mart and Randy's Record Shop to sell. When they started spinning the record on WLAC, the phones lit up, and before he knew it, they were ordering 500 copies at a time. There was no way J.D. could keep up with the demand, and he decided to travel to Nashville for a 'record convention' in 1955. He met with Ernie Young and worked out a deal that would lease the material he was recording back in Crowley to Excello for release and distribution. It turned out to be a great set-up for both men, as they were free to concentrate on what they did best. 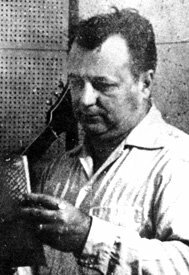 Lightnin's first few Excello singles sold very well in the South, and Miller's studio soon became ground zero for 'swamp-blues', producing some of the greatest records ever. 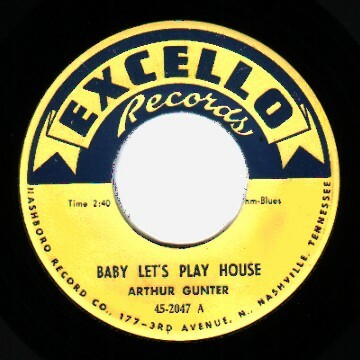 In addition to Lightnin' Slim, Guitar Gable, Lazy Lester, and Lonesome Sundown would all appear on Excello by the end of 1956. James Moore had come up the hard way in the 'Cajun Prairie' outside of Baton Rouge. In addition to working down on the docks, he played both harmonica and guitar at local juke joints and house parties under the name of Harmonica Slim. Lightnin' used him as his harmonica player on gigs around town, and brought him down to Miller's studio in Crowley. 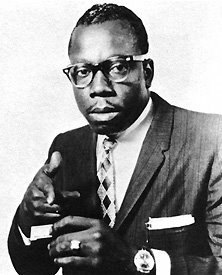 Apparently, there was already a blues man calling himself Harmonica Slim out in Texas, and it was Moore's wife who came up with the moniker "Slim Harpo". His first record for Excello, I'm a King Bee was released in July of 1957. Although it didn't chart, it would go on to become somewhat of an underground smash on both sides of the Atlantic (just ask Mick Jagger). When Harpo's Rainin' in My Heart broke big in 1961, it became the highest selling of any of J.D. Miller's productions up to that point, spending 9 weeks on the charts, and even breaking into the Pop top 40! 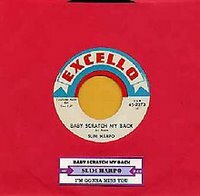 Excello rushed out an album that basically collected the best of his earlier singles for them, and things were looking good. Harpo, apparently unhappy with the way his royalties were being paid, refused to record a follow-up single, and, much to Miller's frustration, essentially 'lost the moment'. 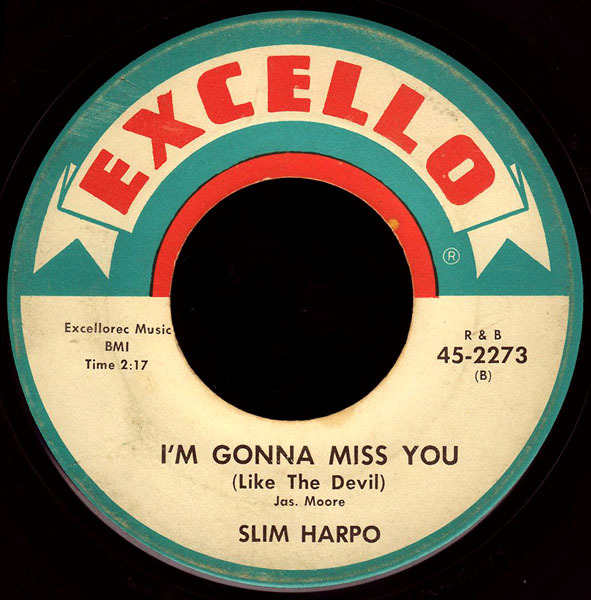 Slim would not chart again for almost five years, but he would make up for it by coming up with his (and Excello's) biggest selling record ever. Baby Scratch My Back was just an absolute monster, spending almost 5 months on the charts in 1966 (including two weeks at #1 R&B), and cracking the top twenty pop. Today's B side is the flip of that amazing single, and continues that great swampy groove. The percussion on Miller's records was always the key, as you can tell here, and supposedly it was the always resourceful Lazy Lester (hero of the Ponderosa Stomp), who was responsible for creating 'that sound' by banging on 2x4's, newspapers, or whatever else was handy. His next single, Shake Your Hips, would be the last recording Slim would make in Crowley. By the end of 1966, Ernie Young had sold his labels to a corporation and left town. The new owners built a new studio and offices on Woodlawn Avenue in Nashville, losing most of that 'funky charm' forever. They also had no use for J.D. Miller, and began producing their biggest star themselves at the new plant. Although Tip On In and Te-Ni-Nee-Ni-Nu sold fairly well in '67 and '68, the new records failed to capture that southwest Louisiana thang. Harpo remained in demand as a live performer, and now had old pal Lightnin' Slim in his band with him. They actually opened for John Mayall's Bluesbreakers at The Fillmore East in March of 1969(! ), and were back in the studio later that year cutting a new record with Crowley regulars Rudolph Richard and James Johnson in an attempt to recapture 'that sound'. A European tour was scheduled for early 1970 to support the album. 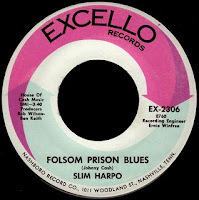 Slim's last recordings were made in late 1969, when Excello A&R chief Shannon Williams flew him up to Nashville to work with producer Bob Wilson. The resulting two singles, Folsom Prison Blues (2306) and I've Got My Finger On Your Trigger (2309) are simply fantastic, and showed the direction Harpo's work was headed in the upcoming decade. Only it was never to be. James Moore died in Baton Rouge General Hospital on the last day of January, 1970. The cause of death was a sudden heart attack, possibly triggered by a drug overdose. He was 46 years old. The album he was working on was released shortly after his death. It was called "He Knew The Blues". One of my favorite b-sides, Red. I was in high school in Memphis when "Scratch My Back" came out and was all over the radio - hard to touch that guitar sound they got and the way cool, unique vibe of both sides. I didn't realize then that it came out of Crowley, LA; but I sure could tell it was from the South. By the way, Tracy Nelson did/does a great version of "I'm Gonna Miss You", which is not often covered. 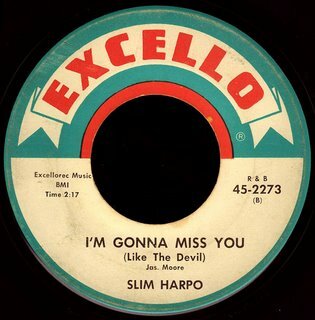 Oh man, I love me some Slim Harpo!! I think you have the concert at the Fillmore a little wrong, Red...It was Slim Harpo, Ten Years After and John Mayall with his new guitarist, Mick Taylor, not the Bluesbreakers. It was a good concert, though. Also, I was playing the guitar for Slim at the time, including those nights, and my band (Weight) and I toured with him until just before his death. That must have been some show, man! theres never been any thing quite like king bee' or Rainin since Slim left way too soon. but his drummer on the Excello stuf 'the god-father of swamp-pop' Warren Storm is still going strong. Why'd Red Kelly say Slim's heart attack may've been from drugs? There's not even a -hint- of this being the case -anywhere-; (but -now- there is, thanks to this lie). I got that information from John Broven's excellent book: South To Louisiana: The Music Of The Cajun Bayous, where it says: "...he was about to make a long-overdue breakthrough, but he died of a heart attack following a suspected drug overdose on January 31, 1970, in Baton Rouge Hospital." I'm not sure where John got his information from, but I certainly would never have just made something like that up.